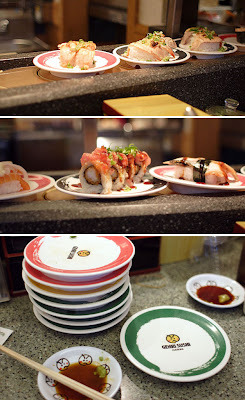 Genki Sushi is a big kaiten-sushi (where the sushi is served on a conveyor belt) chain from Japan. they are everywhere in Japan and now there are a few locations in Hawaii and all over the world. known for their cheap dishes and decent quality fish. the sushi come around on a belt, served on colored plates. the green plates are $1.80, yellow plates are $2.20, red are $2.80 and so on. the baller plates are $4.80 for the Uni and Toro and such. but we stuck to the rasta colors. they have some interesting rolls like the Ahi Poke (marinated ahi w/ seaweed) and garlic seered salmon that were exclusive to the Hawaiian chapters. we got out of there for under $30 for the 2 of us even tho it looked like we had the highest tower of dishes in front of us. not the best quality sushi but for the price, it kills our Tsunami Sushi on Robson st.! advice: even though you see the dish you want doing laps in front of you, order it from the server and you'll get a fresh serving. you never can tell how long that dish has been circling for.